Before another word: a huge thanks to blogger LauraKitty at Sighs and Whispers for posting yesterday and today about the Gobbler Motel and Supper Club: a gem of mid-sixties American kitsch moderne that has tragically been lost to time, with much of it demolished and auctioned off in pieces. Her blog has many fantastic photos of the interior, as well as background on its origins and demise. 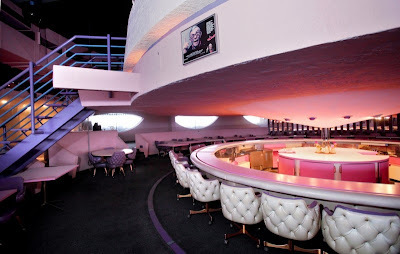 In brief, the Gobbler complex was built by a turkey magnate, explaining, kind of, its motifs and menu options, but not its insanely over-the-top-use of tufted leather, cupids as wall decor, and the color pink. Oh to have lived in Wisconsin past when the ultimate in romantic getaways meant pulling up the GTO to the carport of this UFO-inspired structure ("built to resemble a turkey's head when viewed from the sky"), and then escaping into a world where circular water beds, carpeting on every surface of the interior that wasn't covered in petrified wood or prefab stone, and in-room 8-track players awaited. What to wear to slip into the Gobbler ambiance? Remember, it's the Midwest. So probably a bipolar little number like the one here, which seems a perfect match in dateline and aesthetic, and somehow manages to successfully combine a ladylike cut with a retina-searing pattern. 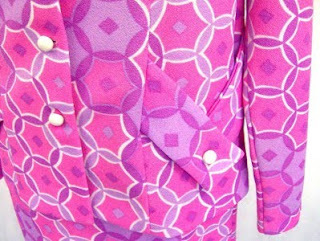 Like the club itself, the suit embodies that endearingly wide-eyed period between Mod and Psychedelic, a time when go-go girls in minis and white boots encountered their first wafts of hookah smoke and mind-altering chemicals. Groovy! See you in the bar, and order me--what else--a Pink Lady. 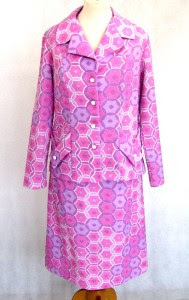 Or how about this 1960s futuristic tunic dress from ShopCurious? Too racy for the Midwest? Surely not!